The familiar and beautiful Black Swallowtail is one of our most intriguing species, part of a fascinating evolutionary puzzle. Among North American members of the Old World Swallowtail species group, genetic analysis by Felix Sperling has identified four major mtDNA lineages, corresponding to four species: the Old World Swallowtail (Papilio machaon), the Anise Swallowtail (P. zelicaon), the Indra Swallowtail (P. indra), and our Black Swallowtail (P. polyxenes). The first three are found only in western and northern North America. P. machaon, or some ancestor thereof, is generally thought to have arrived across the Beringian land bridge from Asia during interglacial periods, spreading eastward and southward and evolving into several new species and sub-species, in a “complex pattern of Pleistocene range fragmentation, hybridization, and ecological race formation” (Sperling and Harrison 1994). One of the new species was P. polyxenes, Black Swallowtail, but whether it evolved earlier or later than the other members of the new world “P. machaon group” we do not know. There may have been several influxes of P. machaon at different times. The Black Swallowtail’s range extends into South America, and though it is closely related to the western Anise Swallowtail, it shows little genetic variation across its large eastern and central American range, except at the southernmost tip in Ecuador. Since genetic variation may indicate greater length of residence, Sperling writes “The fact that mtDNA variation is limited to South America can be interpreted as the result of either a recent range expansion northward, with attendant bottlenecks, or a sweep of selectively advantageous mtDNA variants across the northern part of the range” (Sperling 2003: 441). So it is possible that the Black Swallowtail first arrived in New England from the south; certainly it moved north as the glaciers waned. When Thaddeus W. Harris began his entomological work in New England in the 1820’s, the Black Swallowtail was already known as an agriculturally adapted species par excellence: mowed fields were its habitat, and non-native cultigens its hosts. Harris had Boston-area specimens from 1825, 1828, and 1833 in his collection (Index). Scudder called it “pretty uniformly common throughout New England” (1889:1359; 1862). The species was almost certainly present in heavily forested New England before the European settlers arrived, then apparently increased as agriculture expanded after 1600 (Table 1). Interestingly, although we do not today associate Black Swallowtail with wet meadows, all of its putative native hosts are wet meadow plant species. In northern New England, there are still some remnant sub-populations around bogs and mountain tops which are forest dwellers (Arey, pers. comm. ; Kiel 2003:41), and in Canada in wilder areas it is usually seen near damp meadows (Layberry et al. 1998). Among the native hosts which Harris and Scudder listed for Black Swallowtail were poison hemlock (Conium maculatum Linn.) [not actually native], water hemlock (Cicuta maculata Linn., also C. virosa Linn. and C. bulbifera Linn. ), water parsnip (Sium cicutaefolium Gmel. ), marsh pennywort (Hydrocotyle), angelicas (e.g. A. atropurpurea), and mock bishop’s weed (Ptilimnium capillaceum) (1889:1360). However, there are virtually no recent Massachusetts reports of Black Swallowtails using any of these native wetland plants, where they are still found, except for one 2007 report of Black Swallowtail seen laying eggs on water hemlock (C. maculata) (M. Champagne, Dartmouth, 5/26/2007). In general, like many other butterflies, Black Swallowtail has proved to be an adaptable “switcher” (Table 3). Harris remarked perceptively on the host plant switch; he had found the caterpillars on both native and cultivated hosts: “... parsley, carrot, parsnip, celery, anise, dill, caraway, and fennel of our gardens, as well as on the conium, cicuta, sium, and other native plants of the same natural family, which originally constituted the appropriate food of these insects before the exotic species furnished them with a greater variety and abundance” (1841:212-3). As Harris suggests, land clearing and wetland draining for agriculture reduced the availability of native hosts, while supplying large numbers of nutritious new hosts such as carrots, dill, parsley, caraway, fennel and above all Queen Anne’s Lace, which, as Mrs. William Starr Dana wrote in 1893, “so profusely decks the highways throughout the summer with its white, lace-like clusters...”(Dana 1898: 15). Of the garden plants, caraway (Carum carvi) escaped cultivation and became a widespread weed in our area. All of these introduced plants had been used by P. machaon in Europe, and its descendent P. polyxenes quickly adopted them. All hosts, native or introduced, are in the Apiaceae family, with which the swallowtail apparently co-evolved. It’s most frequently-used host today is probably Queen Anne’s Lace; the first generation in spring uses newly sprouted plants; the second generation larvae eat and live in mainly the flower heads. The “parsley worm” was considered a widespread garden pest in the mid-1800s. Harris wrote that the adults “may be seen in great abundance upon flowers” in July, and Maynard (1886) that it was “one of our most common and best known species.” The caterpillar was the epitome of “injurious insects”: “Their injury to these cultivated plants is by no means inconsiderable; they not only eat the leaves, but are particularly fond of the blossoms, and young seeds. I have taken twenty caterpillars on one plant of parsley which was going to seed.” (Harris 1841: 212-3). Harris recommends destroying the caterpillars by hand every day or two. The Black Swallowtail does not rank among our abundant, or even most common, species today. And there has almost certainly been some decline since the height of the agricultural era (Table 2). MBC reports 2000-2007 rank the Black Swallowtail in the Uncommon-to-Common category (Table 5). Silver-spotted Skipper, American Lady, and Eastern Tailed-Blue were almost twice as common in MBC records, and American Copper, Pearl Crescent and Clouded Sulphur are even more numerous. Spicebush Swallowtail and Viceroy are also in the Uncommon-to-Common category. The 18-year trend shown in Chart 2 does not show a decline. Reported sightings increased through the 1990s. Peak years 2004-2007 were followed by a decline in 2008 and 2009, but overall the trend is upward. List-length analysis (Breed et al. 2012) found a 115% increase for this species 1992-2010. An outbreak seems to have occurred in 2004, when particularly large numbers were reported from four NABA Counts: Northampton (89), Central Berkshire (57), Southern Berkshire (20), and Martha’s Vineyard (33. But the numbers did not seem unusually high on any of the other NABA counts around the state. An interesting question is why Black Swallowtail is not more common, given the ubiquity of the main host, Queen Anne’s Lace, in both urban and rural disturbed areas. But host plant availability is not the only factor affecting butterfly populations. Some studies have shown high levels of insect and bird predation on Black Swallowtail caterpillars. Also, larvae do not seem to fare as well on Queen Anne’s Lace as they do on their cultivated hosts; they are smaller and mature more slowly. Widespread use of pesticides is another major threat; many market gardeners continue to use pesticides despite the popularity of organically-grown produce. And finally, Black Swallowtails are a territorial species; males establish and defend areas which may average 75 square meters. This suggests they need fairly large open areas in order to mate. 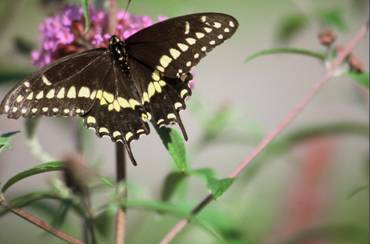 Between 1991 and 2009, Black Swallowtail was found in 172 of the 300 towns for which MBC had records. Probably it can be found in any town with some open agricultural land. It is reported from all counties, including the Berkshires, Cape Cod, Martha’s Vineyard, and Nantucket. The Martha’s Vineyard checklist lists it as Common (Pelikan 2002). In the 1930's, it was also "moderately common" (Nantucket) and "resident and frequent" (Martha's Vineyard) on the islands (Jones and Kimball 1943). In the late 19th century, Scudder (1899) reported only two generations of Black Swallowtail at this latitude. Today, the flight chart drawn from 1993-2008 MBC records (http://www.naba.org/chapters/nabambc/flight-dates-chart.asp) shows three somewhat overlapping flight periods—late May, July-mid August, and September. There are probably now three broods in most areas of Massachusetts (M. Arey; D. Adams; Mello and Hansen 2004:30). Larvae and freshly laid eggs have been observed in September (2011-2013) in Ipswich, West Bridgewater, Shelburne Falls, and Hadley. In warm years these can make it to pupal stage and survive the winter. The first appearance of Black Swallowtails in the spring is earlier now than in the late 1800s, according to our evidence. Scudder wrote, referring to southern New England, that it “appears on the wing in May, generally about the 21st, seldom before the 15th “, although he once saw a male in Boston on May 10 (1889:1362), while Harris said that first emergence in the Boston area was the “last of May or the beginning of June” (1841: 213). A century later, there are now many April records. In thirteen (over half ) of the 23 years 1991-2013, the first sighting was in April. Earliest sightings: In the 23 years of BOM-MBC records 1991-2013, the six earliest "first sighting" dates are 4/12/2006 Canton Great Blue Hill T. Murray; 4/15/2012 Hingham World's End M. Faherty/ New Bedford M. Mello/ Newbury Old Town Hill M. Arey; 4/18/2005 Winchester R. LaFontaine; 4/20/2010 Woburn Horn Pond Mountain M. Arey; 4/22/2009 North Andover Weir Hill H. Hoople; and 4/23/2008 Canton Great Blue Hill M. Champagne. Most of the April sightings have been subsequent to 2000, but there is one 4/27/1991 report. The Atlas reported an early date of 4/14/1977 in Woburn. Latest sightings: In the same 23 years of records, the four latest "last sighting" dates are 10/20/2008 Dartmouth Allens Pond B. Bowker; 10/20/2000 Natick L. Stillwell; 10/17/2011 Duxbury Bay Farm, B. Bowker; and 10/15/2013 Dartmouth Allens Pond, M. Champagne. Most ‘last sightings’ prior to 1999 were in September, whereas all ‘last sightings’ from 2000 through 2013 were in October. The Atlas reported the late ‘extreme date’ as 10/23/1994 in South Dartmouth. Despite their association with open fields and disturbed areas, Black Swallowtails do not thrive in heavily mowed and manicured landscapes such as golf courses and industrial parks. They need large open meadows specifically managed for wildlife, where “weeds” are allowed to go to seed; areas which are mowed only once a year in late fall or spring, or lightly grazed, with floral nectar sources. Most commercial meadow mixes do not include any host plant for Black Swallowtails, because Daucus carota is thought of as “weedy.” Queen Anne’s Lace, as well as parsley, dill and bronze fennel, should be added to meadow mixes.